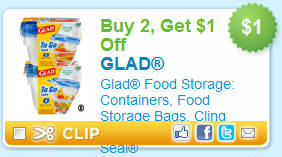 Buy 2, Get $1.00 Off Glad® Food Storage: Containers, Food Storage Bags, Cling Wrap or Press n Seal®. These can include containers, food storage bags, Cling Wrap or Press'n Seal. Found under Household, page one, zip code 90210. You pay $1.49 each when you buy two. You pay $2.00 each when you buy two. Remember - you can also price match at Walmart.